Nearly 5 km wide at some points, and over 400 m deep, the Oribi Gorge is perhaps better classified as a canyon than a gorge. The reserve is located at the confluence of the Mzimkulu and Mximkulwana Rivers. 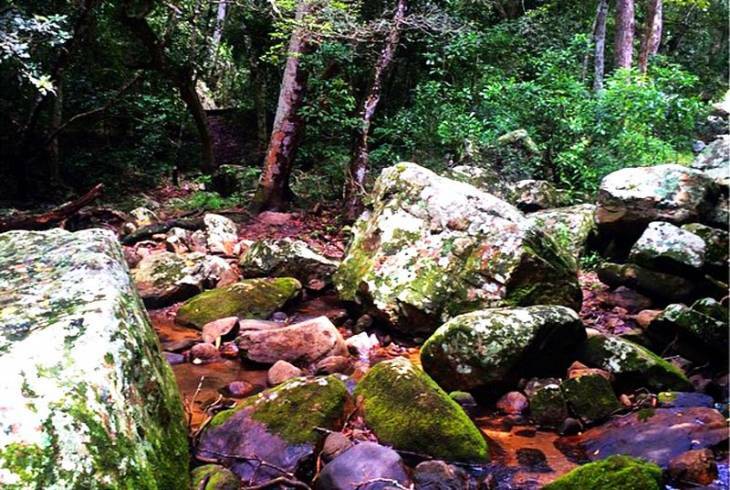 Aeons of erosion by these rivers have carved out nearly 30 km of spectacular kloofs and crags, covered with dense subtropical vegetation. The reserve is bisected by a paved road that descends right to the base of the gorge, where it crosses the river and climbs back up the other side. Beside the bridge there is a picnic / braai area and the starting point of a couple of trails, including the Hoopoe Falls Trail that wends its way along the riverbank, culminating in a delightful well-deserved waterfall. But be cautioned that bilharzia can be contracted from the water. The dense forest of the sandstone cliffs is home to various small mammals, especially both vervet and samango monkeys, bushbuck, duiker, reedbuck and of course the reserves namesake, the oribi. If hiking near the river keep an eye open for the giant water leguan that burrows it's home along the banks of these rivers. Oribi Gorge Nature Reserve Information and Nearby Accommodation.